Second-year Days Adeosun dribbles the ball for the Maroons. After a disappointing, tightly contested loss against North Park, the Maroons had an important weekend to bounce back. They faced their first road trip since the beginning of October with matches against NYU and Brandeis. This trip was a difficult stretch, but a golden opportunity to get back on track for the team. The Maroons took the opportunity with both hands (or feet), with a dominating, defensive display in both matches that led them to victory. Not fazed by the pressure, first-year Aaron Katsimpalis recorded back-to-back clean sheets in his first two career starts, a record that was a huge confidence booster for the team after the loss of their usual starting goalkeeper Hill Bonin. More specifically, the first match against NYU was a comprehensive display in a 3–0 win. Considering the difference in conference standings between the two teams, the Maroons expected the win. Though away matches are always difficult, the Maroons took care of business and had little trouble. "Going into the NYU game, we knew we were going to have to be quick and decisive in the attack to break them down,” third-year midfielder Nicco Capotosto explained. They utilized this game plan to perfection, recording 24 shots in total and an impressive 13 on goal. However, after this match, there awaited a tough road test against Brandeis. This vital conference match against Brandeis was a tense affair with major implications for conference standings. A win for either team would put them in prime position to win the conference championship heading into the final week. Again, Capotosto stated that because “there was a lot at stake for both teams, [they] were really reluctant to break out in attack. 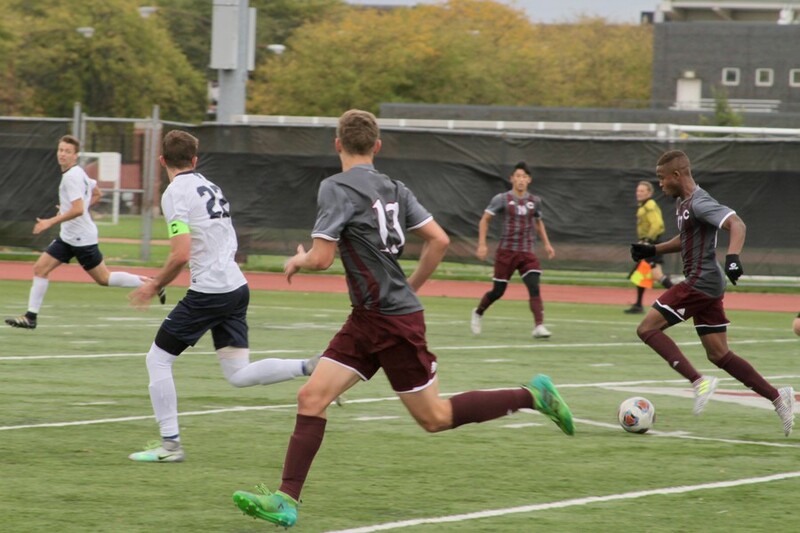 It really turned into a scrappy game where the team that showed more grit was going to win.” The Maroons evidently “showed more grit” with an 79th minute win to take control of the conference. The team is now one win away from clinching their second straight conference title. It all comes down to a home showdown with rival Wash U on Saturday morning at 11 a.m. Given the difference in standings, the Maroons are the favorites to win, but records are often thrown out in a rivalry game. Come down and show your support for the team this Saturday!